"Surely I can find someone to help me," she thought. "Will you help me over the hill with my train of cars? It is so long and heavy I can't get it over." "Don't you see that I am through my day's work? I have been rubbed and scoured ready for my next run. No, I cannot help you,"
"Will you help me bring my train of cars over the hill? It is so long and so heavy that I can't get it over." "I have just come in from a long, long run. Don't you see how tired I am? Can't you get some other engine to help you this time? "I'll try," said the little steam engine, and off she went. Choo, choo! Choo, choo! Choo, choo! "Will you help me over the hill with my train of cars? It is so long and so heavy that I can't get it over." "Yes, indeed!" said this little steam engine. "I'll be glad to help you, if I can." So the little steam engines started back to where the train of cars had been standing. Both little steam engines went to the head of the train, one behind the other. "I-think-I-can! I-think-I-can! I-think-I-can! I-think-I-can! I-think-I-can! I-think-I-can! 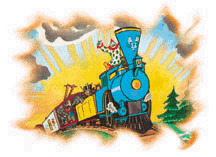 I think I can - I think I can - I think I can I think I can--"
Now they were on the plain again; and the little steam engine could pull her train herself. So she thanked the little engine who had come to help her, and said good-by. "I-thought-I-could! I-thought-I-could! I-thought-I-could! I-thought-I-could! I thought i could - I thought I could - I thought I could - I thought I could - I thought I could - I thought I could I thought I could --"